It’s getting wet out there folks! 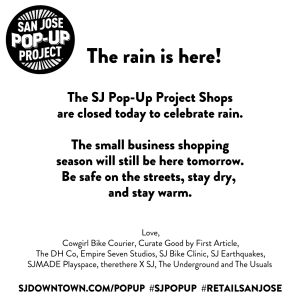 Due to the storm, San Jose Bike Clinic will be joining the rest of the SJ Pop-Ups in taking today (Thursday December 11th, 2014) off. We’ll be open again tomorrow as per usual. Ride on!